Jason Gall with his first Harbour Devils jumper. JASON Gall, of West Tweed Heads, is first to admit that every day is just dawning more golden. Gall, 44, suffered sepsis after swallowing toxic water while surfing off Snapper Rocks three years ago. "I woke up in hospital with no feet and no left hand," said Gall. The double amputee battles each day to live the best life possible and now he and partner Karen Fursman are praising the Tweed District Men of League for necessary renovations carried out to their home. "The Men of League raised the money and volunteer boaties from Greenmount Surf Club Garry Doyle and Geoff Trottman did the work in their spare time," said Fursman. "It cost $9600 and took about four months to complete, and now our lives are just so much better." Gall has dialysis for four hours three times each week at Tweed Hospital, but now he knows he just has to get out of bed, hop in his wheel chair and head for his new shower. "Life just gets better and each day is more golden," said Gall, proudly holding a swim fin given to him by START Foundation that fits on the stump of his right leg. "Kieran Perkins look out! I reckon I can catch anyone with this fin attached." 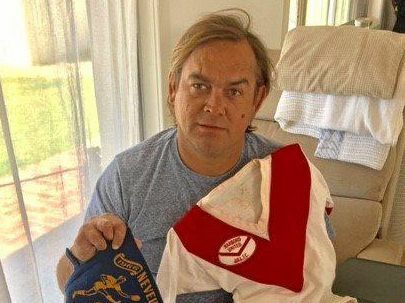 Former Kangaroo, NSW Origin, Manly and Gold Coast Seagulls prop Phil Daley was a surprise visitor for Jason who played football with Harbord Devils' Junior Rugby League Club and also Presidents Cup and Jersey Flegg with Manly Sea Eagles. Soon 'Beaver', 'Hoppy' and Nil Kosef were the flavour of the day with Gall and Daily locked in deep conversation with grins from ear-to-ear. Daley said he felt good to be a member of Tweed Men of League and see the enormous changes made to Jason and Karen's life.